John 15:4-6 IV (KJV) – Abide in me, and I in you. As the branch cannot bear fruit of itself, except it abide in the vine; no more can ye, except ye abide in me. I am the vine, ye are the branches. He that abideth in me, and I in him, the same bringeth forth much fruit; for without me ye can do nothing. If a man abide not in me, he is cast forth as a branch, and is withered; and men gather them, and cast them into the fire, and they are burned. In the previous post in this series on Why Three Glories, a review of how God created us for glory by creating us in His image was presented. In this next post in the series, the discussion is centered on the significance of God fashioning us as vessels after His likeness. In particular, we will look at how our response – as vessels – to the light of God’s word determines the reward we will receive from Jesus Christ when He returns in glory. Why emphasize how God created us as vessels in His image? Briefly comprehended, God created us for a specific purpose, to be His dwelling place. His intention is to reveal Himself in and through us for our eternal welfare and benefit according to His honor and glory. As it is written, God does not dwell in temples made by hands but in the hearts of the righteous. By considering John’s testimony that God is light and God is love, the question then becomes, do we want to be light and love like our Creator who formed us after His own likeness by His Spirit dwelling in us in glory? The answer we give to this question is drawn from the love of our hearts based on whom and what we love. The fact that God created us in His image means that He has made us agents or stewards of His image. As agents, we must give an account of what we have done with His image in this life. Those who magnify and honor His image will be filled with His glory when He returns. On the other hand, those who defile and desecrate His image will be destroyed by God, according to the scriptures. Summed up, God fills those who accept His call, as their Creator, to be like Him with light and love (so He may reveal Himself in and through them). Those who do not want to be like their God – in light and love – God will withdraw His image from them; as a result, they must take upon themselves some other form which is not in the likeness of His image. Jesus Christ will reward each of us according to what our works in this life have been, especially with respect to how we have viewed and treated other people. Luke 6:36-38 IV (KJV) – Be ye therefore merciful, as your Father also is merciful. Judge not, and ye shall not be judged; condemn not, and ye shall not be condemned; forgive, and ye shall be forgiven. Give, and it shall be given unto you; good measure, pressed down, and shaken together, and running over, shall men give into your bosom. For with the same measure that ye mete withal, it shall be measured to you again. As Paul writes, we must all appear before the judgment seat of Christ so that everyone may receive a reward of the deeds done in the body, i.e. in these earthen vessels. II Corinthians 5:8-11 IV (KJV) – We are confident, I say, and willing rather to be absent from the body, and to be present with the Lord. Wherefore we labor, that, whether present or absent, we may be accepted of him. For we must all appear before the judgment seat of Christ, that everyone may receive a reward of the deeds done in the body; things according to what he hath done, whether good or bad. Knowing therefore the terror of the Lord, we persuade men; but we are made manifest unto God; and I trust also are made manifest in your consciences. The significance of Jesus returning in glory to reward us with glory indicates that the reward we will receive from Him will be apportioned and measured or meted out in terms of His glory. Revelation 22:12,13 IV (KJV) – And, behold, I come quickly; and my reward is with me to give every man according as his work shall be. I am Alpha and Omega, the beginning and the end, the first and the last. In a word, His reward is consistent with the image He formed us in, which is after His own image and likeness. God created us in His own image to inhabit us and reveal Himself in us through His Spirit. He formed us as vessels after His own likeness so that He might abide in us and fill us with His glory. He made us for Himself to be the temple of His Holy Ghost, with Jesus Christ as its foundation and chief cornerstone. It is a building which is not made with hands, but is built up in Him to be a city filled with grace and truth. God created us as and for unique expressions of His own character and countenance. Accordingly, He has ordained certain good works for us to walk in by the gift of faith. By these works, which come of light and love, God reveals to the world His own works which bring honor and glory to His name. These are good works that come in and through the very person of Jesus Christ as the fruit of His Spirit of truth, born of and revealed in our lives by faith. They come of His work of faith at work in us, meaning, they come of Jesus Christ and are decidedly not like the dead works that come of our own selves. God is building us up as the body of Jesus Christ who is to abide in our hearts by faith. Because He designed us to be the body of Christ, God intends to manifest Himself to us and speak to us expressly through Jesus Christ, who is His living and abiding Word. After this manner,  God has chosen to reveal His words and works in us, not only in this life, but He also promises to do the same in the eternal life to be revealed in His children in the world to come. God reigns over His temple – the body of Christ – in His light and His love. As it is written, He is the light thereof. In particular, God governs His kingdom in truth and righteousness by the two great commandments upon which all else that He reveals and commands hang or depend. As the husbandman of His creation, He prunes the branches that He grafts into the True Vine by His Spirit to cause each one to bear Him the fruit He is seeking, which is all goodness and righteousness and truth. By creating us in His image, God created us as agents of His image. He invested in us that which belongs to Him and is intimately personal to Him. For this reason, God holds us accountable as agents of His own image. He holds us responsible for what we say and do in this life as bearers of His image and superscription. Accordingly, each and every one of us will be brought into judgment before Jesus Christ for all of our words and deeds (doings), even as by fire. All those who do not resist His Holy Ghost (by hardening their hearts against Him) but willingly receive Him (as God’s intended resident of our bodies), will be raised up unto eternal life in His eternal kingdom. There, the Lord will entrust even greater things into their care by which they may continue to glorify His name to an ever growing extent (see Revelation 2:7, 2:11, 2:17, 2:26-29, 3:5,6, 3:12,13, and 3:21,22). On the other hand, those who defile God’s image – e.g. by worshipping images other than God’s image – God will withdraw His image from them. That is to say, He will take away the agency (of His image) which He gave them in the beginning, by turning them over to themselves to work evil and vile works with their bodies in this life and the complete removal of His image from them in the life to come. The Lord can and may take away agency from someone. This was illustrated by Jesus in His parable of the talents given in the 25th chapter of Matthew. Note how Jesus follows this parable with a description of the judgment to come at His return in glory. There, in the second half of Matthew 25, Jesus describes the judgment that awaits all of us based on how we have treated others in this life. Therefore, Jesus and His disciples taught that we should be perfect even as our Father in heaven is perfect in love. The practical effect of having this agency removed from them is that they become cut off or separated from the Lord’s presence. That is, His light and love no longer will reside within them. By removing His image from them and, thereby, taking away this precious gift of agency, they must go into an eternal state or condition of shame in which there is no true glory, a state of darkness void of light and truth. We were not created to live lives separated from our God or to exist independent of Him. Rather we were created to be the city of God, the city in which He dwells, a city whose builder and maker is God and a temple not made with men’s hands. To summarize, through Jesus Christ, God is now building us up as His dwelling place so that He might abide with us and in us as His eternal abode. Through the works which He does through us, our Lord offers those who know not God and who live in this world without Him the opportunity to become a part of His body unto eternal salvation through becoming one with Him. Because people respond differently to His word, God has prepared an array of glories of varying revelations of His light and love. As noted above, Paul likened these to the lights in the sky: the glory of the sun, the glory of the moon, and the glory of the stars (see Why Three Glories – Part 1: Eyes to See & Ears to Hear). To minister to each of these three glories, God manifests Himself in three unique ways, as the Father, Son, and Holy Ghost. Consequently, individuals and groups of individuals in these three glories see and understand God differently according to the light they receive. Those in whom the fullness of God dwells, i.e. those who are saved to the uttermost, will see God as One according to Jesus’ prayer. John 17:11,20-24 IV (KJV) – And now I am no more in the world, but these are in the world, and I come to thee. Holy Father, keep through thine own name those whom thou hast given me, that they may be one, as we are…. Neither pray I for these alone, but for them also which shall believe on me through their word; That they all may be one; as thou, Father, art in me, and I in thee, that they also may be one in us; that the world may believe that thou hast sent me. And the glory which thou gavest me I have given them; that they may be one, even as we are one; I in them, and thou in me, that they may be made perfect in one; and that the world may know that thou hast sent me, and hast loved them, as thou hast loved me. Father, I will that they also, whom thou hast given me, be with me where I am; that they may behold my glory, which thou hast given me; for thou lovedst me before the foundation of the world. These are they who will be filled with His glory as the brightness of the sun. That is, they will see the Father and the Son as one in a way that can only be comprehended through the fullness of God dwelling within them. Others will reflect the glory of the Lord as the moon reflects sunlight. These will shine forth in the darkness according to the glory of the moon, even as the moon rules over the darkness. Because there is no darkness in God, His fullness does not dwell in them and, therefore, their view and experience with God is that the Father and Son are two separate beings. Though the moon gives off light, it does not generate its own light. Nonetheless, it periodically reflects the light of God to those who sit in darkness according to its seasons. Finally, others will shine in the night sky with a glory that can only be seen at night, i.e. in the absence of the sun. They do not reflect the glory of the Father or the Son directly. Rather, their glory is that of the stars who appear distant and remote. Among the stars there is a wide range of light that each emits “…as one star differs from another.” These receive their light remotely from the sun and the moon, being prepared to provide a faint light to those who wander in the night. CAUTION: No person or group of people can just think their way into a particular glory. Adopting a specific definition or view of God is not what is required to inherit a particular glory. Rather, the glories are the Lord’s to reward to everyone according to each person’s response to Him and His words as agents of His image. The glory each one of us will receive is the result of the way in which we live our lives. Those who are just will receive their reward in the resurrection of the just. Those who are unjust, will likewise receive their reward in a resurrection suited for them, namely, in the resurrection of the unjust. To receive our reward with the faithful, we must, like them, be just in what we say and do to the extent that we receive the testimony that we please God. If we truly live by faith, we will be just and God will give us this testimony (report) – that they please Him – so we may not be deceived. Hebrews 11:1-6 IV (KJV) – Now faith is the assurance of things hoped for, the evidence of things not seen. For by it the elders obtained a good report. Through faith we understand that the worlds were framed by the word of God, so that things which are seen were not made of things which do appear. By faith Abel offered unto God a more excellent sacrifice than Cain, by which he obtained witness that he was righteous, God testifying of his gifts; and by it he being dead yet speaketh. By faith Enoch was translated that he should not see death; and was not found, because God had translated him; for before his translation he had this testimony, that he pleased God. But without faith it is impossible to please him; for he that cometh to God must believe that he is, and that he is a rewarder of them that diligently seek him. So it is written, the just shall live by faith. Romans 1:16,17 IV (KJV) – For I am not ashamed of the gospel of Christ; for it is the power of God unto salvation to every one that believeth; to the Jew first, and also to the Greek. For therein is the righteousness of God revealed through faith on his name; as it is written, The just shall live by faith. Without this testimony, we cannot have hope in this world of a favorable reward in the life to come. For the God who created the ear can and most assuredly does speak to each person. The question is, will we hear Him and give heed to His words or not? Jesus said His sheep know His voice. Do you know His voice? You may, if you are willing to actually follow Him. If you would seek a goodly reward of the Lord, be sure to put on the robes He is attempting to clothe you with each day, even His robes of His righteousness. Be just and fear not, for He is with you and labors to this end, even for the everlasting welfare of your souls. Those who do not heed His call will have their reward separate from Him outside the light of His love. Those who take His precious mantle of righteousness upon themselves will find their dwelling place with Him in His kingdom. May God be with you as you read His word and seek His face in daily prayer and fasting. This is my hope and prayer for each one, that each one will consider the matter of the glories in the light of Jesus Christ. For those who are unwilling to do so, for what can they hope? Even still, it is my desire that each one would live such that they might be found acceptable to our Lord according to His redeeming love. To all who willingly receive Jesus Christ into their hearts by faith, may you continue on in His peace. Remember that His work is everlasting, and treasure for yourselves eternal life with Him in His kingdom. For to this end have I written, that you may know and have the hope of glory abiding in you in this life and the glory to come which is reserved for all the faithful who put their trust in Jesus Christ unto living and abiding in Him. To Him be the glory forever and ever. He created us so He could be our glory, even our everlasting life in His kingdom. So may we honor Him accordingly, and we have His promise that He will reward us with Himself in the fullness of His glory. Either on His right hand or His left hand. As I pondered what could be done about the disunity and the many divisions that exist in the body of Christ, the church, the Lord led me to take out a notepad and draw a large plus sign in the middle of the page. Next, I understood that I was to sketch a vessel centered within each quadrant formed by the plus sign. 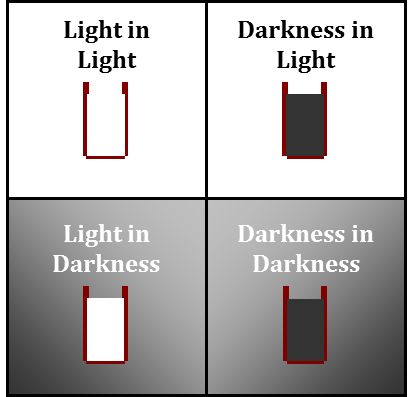 When placing labels on the diagram, as illustrated here, it became evident that the four basic ways a vessel, such as a jar, can “interact” with light could be conveniently summarized in this manner. Specifically, the diagram demonstrated how a vessel can be filled either with light or with darkness while being placed in a space or room that is filled either with light or with darkness. John 15:4,5 IV (KJV) – Abide in me, and I in you. As the branch cannot bear fruit of itself, except it abide in the vine; no more can ye, except ye abide in me. I am the vine, ye are the branches. He that abideth in me, and I in him, the same bringeth forth much fruit; for without me ye can do nothing. Using these and similar scriptures, the Lord made it plainly evident to me that we are to abide in the light of Jesus Christ as the vessels He has created for His habitation. Stated another way, Jesus Christ is calling each of us to be one with Him by being filled with and surrounded by His presence of light. This message is further reinforced by the words of Jesus found in the following verses. John 8:12 IV (KJV) – Then spake Jesus again unto them, saying, I am the light of the world; he that followeth me shall not walk in darkness, but shall have the light of life. John 12:46 IV (KJV) – I am come a light into the world, that whosoever believeth on me should not abide in darkness. In keeping with His words, our Lord’s prophets have likewise spoken of Him as a great light that was to arise upon those who sit in darkness. Isaiah 9:1,2 IV (KJV) – Nevertheless the dimness shall not be such as was in her vexation, when at the first he lightly afflicted the land of Zebulun, and the land of Naphtali, and afterward did more grievously afflict her by the way of the Red sea, beyond Jordan, in Galilee of the nations. The people that walked in darkness have seen a great light; they that dwell in the land of the shadow of death, upon them hath the light shined. Luke 1:75-78 IV (KJV) – And thou, child [John the Baptist], shalt be called the prophet of the Highest, for thou shalt go before the face of the Lord to prepare his ways, To give knowledge of salvation unto his people, by baptism for the remission of their sins, Through the tender mercy of our God; whereby the day-spring from on high hath visited us, to give light to them who sit in darkness and the shadow of death; to guide our feet into the way of peace. The practical nature of the lesson illustrated by the diagram became clear as I considered how we, as vessels fashioned by God, are given opportunity in this life to interact with Him in His light revealed in and through Jesus Christ. The way we interact with His light depends upon our love for God and for each other according to His word of truth; and how we respond to His call to repent and believe the gospel will determine which of these combinations or arrangements we as individuals and groups of individuals will reside in now and forever. Those individuals willing to both abide in and be filled with His light will receive of His fullness. This is His will for us. This is His purpose in creating us in His image: that we would be like Him in light and in love through the glory of His Spirit dwelling within and around us. Ephesians 3:14-19 IV (KJV) – For this cause I bow my knees unto the Father of our Lord Jesus Christ, of whom the whole family in heaven and earth is named, That he would grant you, according to the riches of his glory, to be strengthened with might by his Spirit in the inner man; That Christ may dwell in your hearts by faith; that ye, being rooted and grounded in love, May be able to comprehend with all saints what is the breadth, and length, and depth, and height; And to know the love of Christ, which passeth knowledge, that ye might be filled with all the fullness of God. Acts 26:13-18 IV (KJV) – At midday, O king, I [Paul] saw in the way a light from heaven, above the brightness of the sun, shining round about me and them which journeyed with me. And when we were all fallen to the earth, I heard a voice speaking unto me, and saying in the Hebrew tongue, Saul, Saul, why persecutest thou me? it is hard for thee to kick against the pricks. And I said, Who art thou, Lord? And he said, I am Jesus whom thou persecutest. But rise, and stand upon thy feet; for I have appeared unto thee for this purpose, to make thee a minister and a witness both of these things which thou hast seen, and of those things in the which I will appear unto thee; Delivering thee from the people, and from the Gentiles, unto whom now I send thee, To open their eyes, and to turn them from darkness to light, and from the power of Satan unto God, that they may receive forgiveness of sins, and inheritance among them which are sanctified by faith that is in me. I John 1:3-7 IV (KJV) – That which we have seen and heard declare we unto you, that ye also may have fellowship with us; and truly our fellowship is with the Father, and with his Son Jesus Christ. And these things write we unto you, that your joy may be full. This then is the message which we have heard of him, and declare unto you, that God is light, and in him is no darkness at all. If we say that we have fellowship with him, and walk in darkness, we lie, and do not the truth. But if we walk in the light, as he is in the light, we have fellowship one with another, and the blood of Jesus Christ his Son cleanseth us from all sin. To this end, then, the Lord sends ministers like Paul “To open their eyes, and to turn them from darkness to light, and from the power of Satan unto God.” Nevertheless, we read that not everyone will receive of the fullness of our Lord’s light and love. II Corinthians 4:3-5 IV (KJV) – But if our gospel be hid, it is hid to them that are lost; In whom the god of this world hath blinded the minds of them which believe not, lest the light of the glorious gospel of Christ, who is the image of God, should shine unto them. For we preach not ourselves, but Christ Jesus the Lord; and ourselves your servants for Jesus’ sake. Why is this ministry necessary? In the words of Jesus, men love darkness rather than light, because their deeds are evil. John 3:18,19 IV (KJV) – He who believeth on him is not condemned; but he who believeth not is condemned already, because he hath not believed on the name of the Only Begotten Son of God, which before was preached by the mouth of the holy prophets; for they testified of me [Jesus]. And this is the condemnation, that light is come into the world, and men love darkness rather than light, because their deeds are evil. As a result, there are other combinations in which each vessel created by the Lord may interact with Him as light. Each of these combinations will be discussed in more detail later in this post. First, we must ask, are these four combinations of the interaction of light and vessels spoken of in scripture? In Jesus’ parable of the sower, He speaks of four distinct responses to the word of God. Luke 8:10 IV (KJV) – …Unto you [Jesus’ disciples] it is given to know the mysteries of the kingdom of God; but to others in parables; that seeing they might not see, and hearing they might not understand. John 12:46-48 IV (KJV) – I am come a light into the world, that whosoever believeth on me should not abide in darkness. And if any man hear my words, and believe not, I judge him not; for I came not to judge the world, but to save the world. He that rejecteth me, and receiveth not my words, hath one that judgeth him; the word that I have spoken, the same shall judge him in the last day. How and to what extent we receive or reject the words of Christ determines how we will be judged by His words. To those who receive His words, the Lord gives them more abundantly according to His words. To those who do not receive or continue to receive His words, that which they may have already received of Him will be taken from them until they eventually know nothing about Him and His words. In other words, they are shut out of His light, meaning His presence, to be sent into outer darkness according to their love of darkness. Luke 8:10 IV (KJV) – Take heed therefore how ye hear: for whosoever hath, to him shall be given; and whosoever hath not, from him shall be taken even that which he seemeth to have. Romans 11:22 IV (KJV) – Behold therefore the goodness and severity of God; on them which fell, severity; but toward thee, goodness, if thou continue in his goodness; otherwise thou also shalt be cut off. The last chapter of the Bible testifies plainly with this parable of four eternal estates that await us. There the Lord describes what will be the eternal estate of every person according to their love of God’s word, i.e. their reception or rejection of His word. Note again the four unique conditions in which individuals will remain following the final judgment. Note also how the Lord pronounces His judgment using the word “let.” Meaning, the Lord will let us pass on into eternity according to how we have lived our lives. This is why the period of time before this final pronouncement is made is so very important to everyone. To prepare us during this time, the Lord is calling us to let His words dwell in us richly unto the renewing of our minds in Jesus Christ. Colossians 3:16,17 IV (KJV) – Let the word of Christ dwell in you richly in all wisdom; teaching and admonishing one another in psalms and hymns and spiritual songs, singing with grace in your hearts to the Lord. And whatsoever ye do in word or deed, do all in the name of the Lord Jesus, giving thanks to God and the Father by him. Philippians 2:3-8 IV (KJV) – Let nothing be done through strife or vainglory; but in lowliness of mind let each esteem other better than themselves. Look not every man on his own things, but every man also on the things of others. Let this mind be in you, which was also in Christ Jesus; Who, being in the form of God, thought it not robbery to be equal with God; But made himself of no reputation, and took upon him the form of a servant, and was made in the likeness of men; And being found in fashion as a man, he humbled himself, and became obedient unto death, even the death of the cross. We will now look more closely at these four stations around the cross of Jesus Christ. John 12:31-33 IV (KJV) – Now is the judgment of this world; now shall the prince of this world be cast out. And I, if I be lifted up from the earth, will draw all men unto me. This he said, signifying what death he should die. By Jesus saying He will draw all men unto Himself, He affirmed that He will account for every person who has lived, is living, or ever will live. 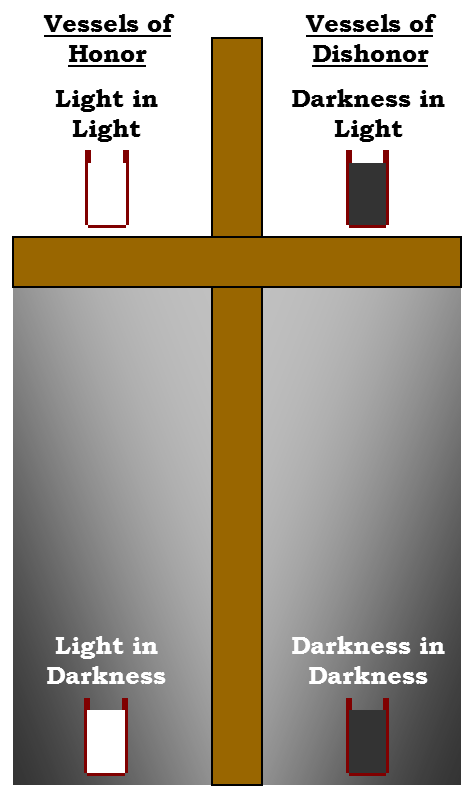 This is what the diagram of the cross above illustrates. It shows that the cross divides all humanity into four distinct judgments based upon how each one responds to Jesus Christ as the Word made flesh, as the Light of the world. It means that each person will occupy one of these four stations around the cross of His sufferings according to the works done in the flesh. II Corinthians 5:9,10 IV (KJV) – Wherefore we labor, that, whether present or absent, we may be accepted of him. For we must all appear before the judgment seat of Christ, that everyone may receive a reward of the deeds done in the body; things according to what he hath done, whether good or bad. Revelation 20:11-15 IV (KJV) – And I saw a great white throne, and him that sat on it, from whose face the earth and the heaven fled away; and there was found no place for them. And I saw the dead, small and great, stand before God; and the books were opened; and another book was opened, which is the book of life; and the dead were judged out of those things which were written in the books, according to their works. And the sea gave up the dead which were in it; and death and hell delivered up the dead which were in them; and they were judged every man according to their works. And death and hell were cast into the lake of fire. This is the second death. And whosoever was not found written in the book of life was cast into the lake of fire. Some people will be raised as vessels of honor through becoming vessels of light. Others will be raised as vessels of dishonor through remaining vessels of darkness. II Timothy 2:20,21 IV (KJV) – But in a great house there are not only vessels of gold and of silver, but also of wood and of earth; and some to honor, and some to dishonor. If a man therefore purge himself from these, he shall be a vessel unto honor, sanctified, and meet for the master’s use, and prepared unto every good work. Comparing these two scriptures provides us with a deeper understanding as to what it means to reside in the various stations around the cross. For example, the unjust are those who are not justified by faith before God. As it is written, the word preached did not profit them, not being mixed with faith in them that heard it (see Hebrews 4:2). Thus, they are unhappy forever, having no justification before God by having no covering for their sins but darkness. And so they are inherit the darkness they loved rather than the light of God. To be justified, and thus be blessed of God (made happy in God), each of us must have faith on God’s Word, who is Jesus Christ. Romans 10:16 IV (KJV) – So then faith cometh by hearing, and hearing by the word of God. Luke 11:29 IV (KJV) – And he said, Yea, and blessed <happy> are all they who hear the word of God, and keep it. John 13:13-17 IV (KJV) – Ye call me Master and Lord; and ye say well; for so I am. If I then, your Lord and Master, have washed your feet; ye also ought to wash one another’s feet. For I have given you an example, that ye should do as I have done to you. Verily, verily, I say unto you, The servant is not greater than his lord; neither he that is sent greater than he that sent him. If ye know these things, happy are ye if ye do them. To have such faith, we must receive Jesus Christ as the light of the world, even the word of God. John 1:4,5,9-12 IV (KJV) – In him was the gospel, and the gospel was the life, and the life was the light of men; And the light shineth in the world, and the world perceiveth it not. … Which was the true light, which lighteth every man who cometh into the world; Even the Son of God. He who was in the world, and the world was made by him, and the world knew him not. He came unto his own, and his own received him not. But as many as received him, to them gave he power to become the sons of God; only to them who believe on his name. He was born, not of blood, nor of the will of the flesh, nor of the will of man, but of God. And the same word was made flesh, and dwelt among us, and we beheld his glory, the glory as of the Only Begotten of the Father, full of grace and truth. Otherwise we are condemned already and will remain so on into eternity according to Revelation 22:11. John 3:16-21 IV (KJV) – For God so loved the world, that he gave his Only Begotten Son, that whosoever believeth on him should not perish; but have everlasting life. For God sent not his Son into the world to condemn the world; but that the world through him might be saved. He who believeth on him is not condemned; but he who believeth not is condemned already, because he hath not believed on the name of the Only Begotten Son of God, which before was preached by the mouth of the holy prophets; for they testified of me. And this is the condemnation, that light is come into the world, and men love darkness rather than light, because their deeds are evil. Therefore, according to Jesus’ words, because they lack faith, and thus have not been born again of the Spirit of truth, they must remain outside of the kingdom of God. John 3:3,5-7 IV (KJV) – Jesus answered and said unto him, Verily, verily, I say unto thee, Except a man be born again, he cannot see the kingdom of God. … Jesus answered, Verily, verily, I say unto thee, Except a man be born of water, and the Spirit, he cannot enter into the kingdom of God. That which is born of the flesh, is flesh; and that which is born of the Spirit, is spirit. Marvel not that I said unto thee, Ye must be born again. A more complete discussion of this station and the other three stations around the cross will be added to this post as time permits. For now I encourage you to recall how God fills those who gladly and expectantly receive Him with His light and His love through the gift of the Holy Ghost. After this manner He makes those who receive Him one temple, one which is not made with hands. But He limits the day in which we may believe and enter into His glorious rest. Hebrews 3:6-15 IV (KJV) – But Christ as a son over his own house; whose house are we, if we hold fast the confidence and the rejoicing of the hope firm unto the end. Wherefore as the Holy Ghost saith, Today if ye will hear his voice, Harden not your hearts, as in the provocation, in the day of temptation in the wilderness; When your fathers tempted me, proved me, and saw my works forty years. Wherefore I was grieved with that generation, and said, They do always err in their heart; and they have not known my ways. So I sware in my wrath, They shall not enter into my rest. Take heed, brethren, lest there be in any of you an evil heart of unbelief, in departing from the living God. But exhort one another daily, while it is called Today; lest any of you be hardened through the deceitfulness of sin. For we are made partakers of Christ, if we hold the beginning of our confidence steadfast unto the end; While it is said, Today if ye will hear his voice, harden not your hearts, as in the provocation. John 14:15-18 IV (KJV) – If ye love me, keep my commandments. And I will pray the Father, and he shall give you another Comforter, that he may abide with you forever; even the Spirit of truth; whom the world cannot receive, because it seeth him not, neither knoweth him; but ye know him; for he dwelleth with you, and shall be in you. I will not leave you comfortless; I will come to you. As you expectantly await our Lord’s return, then, remember most especially the seventh of the seven principles of the gospel listed in the beginning of the sixth chapter of Hebrews, that is, to go on unto perfection, and we will if God permits. Hebrews 6:1-3 IV (KJV) – Therefore not leaving the principles of the doctrine of Christ, let us go on unto perfection; not laying again the foundation of repentance from dead works, and of faith toward God. Of the doctrine of baptisms, of laying on of hands, and of the resurrection of the dead, and of eternal judgment. And we will go on unto perfection if God permit. For he hath made it impossible for those who were once enlightened, and have tasted of the heavenly gift, and were made partakers of the Holy Ghost, And have tasted the good word of God, and the powers of the world to come, If they shall fall away, to be renewed again unto repentance; seeing they crucify unto themselves the Son of God afresh, and put him to an open shame. Why and how God permits us to go on unto perfection is dependent upon how each of us treat and represent His image in this life according to how we think and what we do. May these writings encourage you, then, to be wise and to take into consideration how you are representing Him according to the calling He placed upon your life by creating you in His image. Then, act accordingly. If you do, according to Jesus Christ’s admonition, you will lay up store treasure in heaven that He might reward you accordingly and openly when He returns in glory by honoring His image. The Resurrection of the Just: Just or Unjust? This is the question. Hebrews 1:1-4, James 1:21-25, I Peter 1:10-16, II Peter 3:9-15, etc. As a practical example of what being created in God’s image entails, our God is a God of words that accomplish work (for by them He created all things). Therefore, by creating us in His image God has equipped us with the capability to express ourselves in the same manner, with words that do work. Therefore, as His agents, agents of His image, through our words we too are to accomplish work, His work. According to Jesus, these are the words of faith given to us to speak, the effect of which is that we may command even a mountain to be moved, for example, and it will be moved.